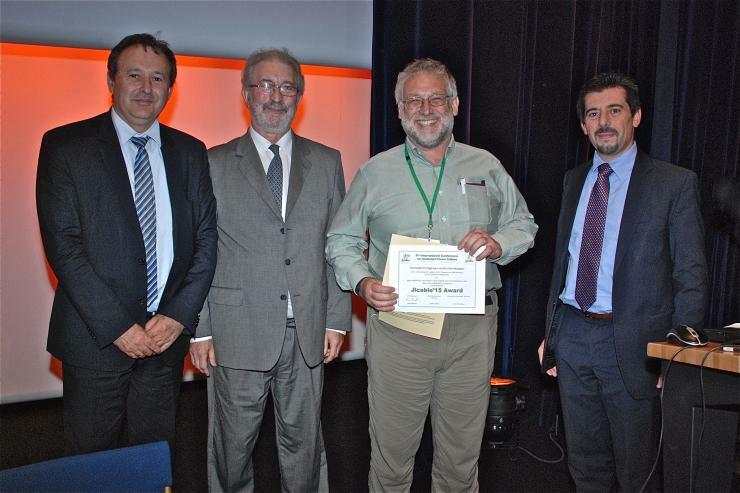 Nigel Hampton was honored with the Jicable'15 Prize at the 9th International Conference on Insulated Power Cables, held June 21-25 in Versailles, France. A principal research engineer at the National Electric Energy Testing, Research, and Applications Center (NEETRAC), Hampton received this best paper award for his work entitled “C3.5: Estimating the Impact of VLF Frequency on Effectiveness of VLF Withstand Diagnostics.” His coauthors on the paper are fellow NEETRAC research engineer and Georgia Tech School of Electrical and Computer Engineering (ECE) Ph.D. graduate Josh Perkel; Vivek Tomer and Marina Kuntsevich of the Dow Chemical Company (a NEETRAC member company); and Jean Carlos Hernandez, a Tech ECE Ph.D. graduate who is now the ECE department chair at the University of Merida in Venezuela and who works with NEETRAC in the summers as a visiting fellow. The prize also recognizes Hampton’s technical leadership, his sharing of knowledge in the field of polymeric cable insulation testing and diagnostics, and his demonstrated enthusiastic approach. The paper helped to answer a question about the influence of voltage testing frequency on underground cable systems, which has been an important issue for the cable diagnostic testing community. Specifically, the paper addressed a longstanding problem with one of the most popular and effective Cable System Diagnostic methods – the Very Low Frequency (VLF) Withstand or Proof Test – that is deployed around the world. The VLF test uses different test frequencies to perform the Proof Test. However, the efficiency of the different frequencies has not been established. This paper reports laboratory test and evaluations of field tests that show the concerns over the test frequency cannot be verified. Thus, the efficacy of this very widely used test is better assured. Established in 1984, the 9th International Conference on Insulated Power Cables (also known as Jicable) is the premier quadrennial international cable conference, and the Best Paper Prize has been awarded eight times since then. At the recent conference, there were 360 technical papers and 850 delegates from around the world. Nigel Hampton (2nd from right) was presented with the Jicable’15 Prize. He is pictured with (L-R) Laurent Tardif, chair of the Jicable Overall Committee; Lucien Deschamp, Jicable organizer; and Marco Marelli, chair of the International Technical and Scientific Organising Committee.